Nearly a half a million Gullah live between Jacksonville, North Carolina and Jacksonville, Florida today. This 500 mile stretch along the Atlantic Ocean and over and between the Rivers that surround it is home to the descendants of the Africans brought to the Carolina Colony beginning in the late 1500s. They live along the interstates and corridors which sometime meander around and touch the borders of Interstate 95 and Highway 17. For nearly five centuries, their lives have been economically and politically tied to this region and the "cash crops" needed for its success whether it be rice or tourism. Places in and around Wilmington, North Carolina, Georgetown and Charleston, South Carolina, Savannah and Jacksonville, Florida figure prominently in the Gullah story from the beginning to now. Their origin and history began on African soil. During the slave trade, captured Africans, destined for American plantations, were often retained in holding cells along the West African coastlines. This imprisonment brought an unprecedented large number of diferrent Africans together under one roof and formed the basis for the outline and structure of what became and is called Gullah culture. .
By the mid 1700s, these Africans dominated the slave labor force. They became the muscle and mind behind the rice and cotton industries that once lined the waters of the Carolina Slave Coast. Their knowledge of farming, rice, rice cultivation, along with their labor, made the Gullah the most desired and sought after labor of the agricultural South. These Gullah slave farmers made their owners some of the wealthiest businessmen in pre-Civil War America. It is popular belief that the name Gullah is a distortion of the name Angola, a region that supplied some 40% of the slaves brought to and sold at the Charleston slave market. However, some members of the Gullah community tend to associate the name with the pre American story of the Golas and the Gizzis, two cultural groups living near Liberia during the African slave trade. Members of these groups were also captured and sold in large numbers. Africans from their region along the Windward Coast entered through Charleston and were well represented in the slave population. In the early days, slaves reserved the name title Gullah for certain members of their communities. The name was not used in the widespread way that it is used today. At that time, it was used more as a handle or prefix as was the case of Golla Jack in the Denmark Vessey Conspiracy of 1822. Until this day, the similarities in the African and American names of these groups, the Golas (Gullah) and the Gizzis (Geechees), could very well be the source of the importance placed on whether one is called Gullah or Geechee today. 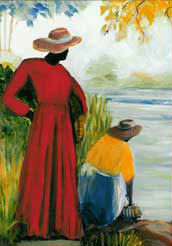 The Gullah represent one of the oldest culture groups surviving and living among us today. They are acknowledged for their contributions to the growth, development and success of the Rice and Sea Island cotton industries of the slave period. During the early days of freedom, their underpaid labor contributed to the re-growth and recovery of the region they inhabited. By the the 1940s, the shift from agriculture to tourism made them the dominate labor force in and of the hospitality industry, the chief income in every state wherever they reside in large numbers today. In the 21st Century, the 500-mile region where the Gullah live is nationally recognized as endangered land right within our midst.